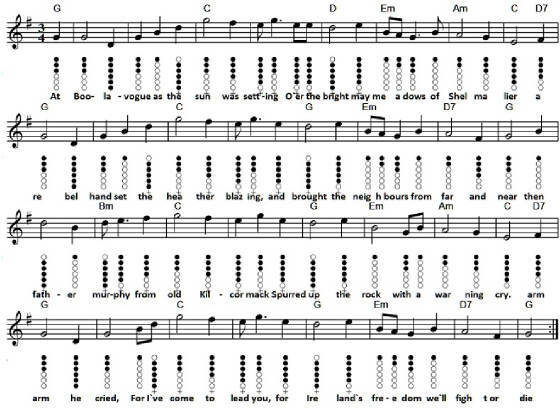 Boolavogue Sheet Music And Tin Whistle Notes, a traditional Irish tune about Father Murphy fight in the 1798 rebellion. Boolavogue lyrics + chords . The youtube video will help you learn the tune. I have given two pieces of music for this one. The first is the one I'm using to play in the video. I use a C whistle only because this tune goes very high and I find the C keeps the noise down a little bit. I tried the sheet music with a D whistle and it works also. Below is another version in lower key. This one goes very high. It goes all the way to the high G note. Blow harder to get the higher notes.